*Hyper DIMM support is subject to the physical characteristics of individual CPUs. Some hyper DIMMs only support one DIMM per channel. Refer to Memory QVL (Qualified Vendors List) for details. **Please visit www.asus.com or refer to the user manual for the Memory QVL. - CeraM!X Heatsink Coating Tech. TUF /tΛf/, stands for The Ultimate Force. This motherboard supports the latest Intel® Lynnfield processors in LGA1156 package which has memory and PCI Express controller integrated to support 2-channel (4 DIMMs) DDR3 memory and 16 PCI Express 2.0 lanes providing great graphics performance. Intel® Lynnfield processor is one of the most powerful and energy efficient CPU in the world. 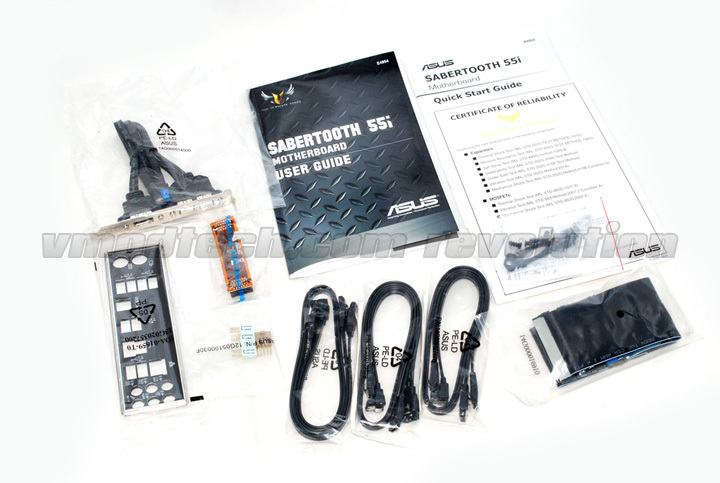 SABERTOOTH 55i brings you the multi-GPU choice of either SLI™ or CrossFireX. 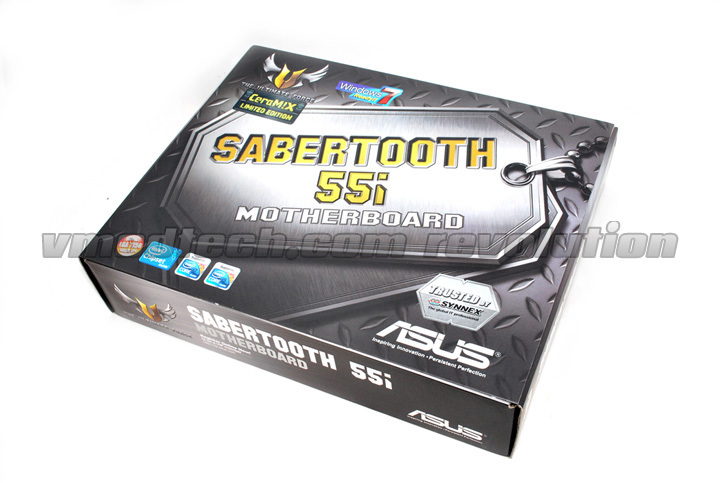 The motherboard features the most powerful Intel P55 platform to optimize PCIe allocation in multiple GPU configurations. Expect a brand-new gaming style you’ve never experienced before! The Intel® P55 Express Chipset is the latest one-chipset design to support latest 1156 socket Intel® Core™ i7/Core™ i5 Processors. Intel® P55 providing improved performance by utilizing serial point-to-point links, allowing increased bandwidth and stability. The motherboard supports DDR3 memory that features data transfer rates of 2000 / 1800 / 1600 /1333 / 1066 MHz to meet the higher bandwidth requirements of the latest 3D graphics, multimedia, and Internet applications. The dual-channel DDR3 architecture enlarges the bandwidth of your system memory to boost system performance. CeraM!X - Heatsink Coating Tech. Innovative ceramics actively conducts heat away from the system. It replaces traditional anti-oxidant to dissipate heat better with its microscopic irregular surface and enlarged area. Better cooling leads to overall improvement in system stability. The T.Probe microchip detects and balances power phase loads and temperatures real-time. With optimal power phase functions, components run cooler and extend system lifespan. CoolMem! fan frame provides an effective and easy DIY way to cool the memory. The frame encloses 40mm or 50mm fans and fits them directly over the memory module. CoolMem! Fan Frame keeps your memory under a proper operating temperature, helping your system cool and stable. Fan Xpert intelligently allows users to adjust both the CPU and chassis fan speed according to different ambient temperature , which is caused by different climate conditions in different geographic regions and system loading.Built-in variety of useful profiles offer flexible controls of fan speed to achieve a quiet and cool environment. Exclusively for this motherboard, the switching power design is provided not only for the CPU, but also for other key components such as graphics card, PCI slots, and chipsets. E.S.P. dramatically improves system efficiency and reduces heat generation. Get rugged performance even in the most challenging conditions with robust capacitors and MOSFETs–certified through third-party, military-grade testing. MemOK! quickly ensures memory boot compatibility. This remarkable memory rescue tool requires a mere push of a button to patch memory issues. MemOK! determines failsafe settings and dramatically improves your system boot success. Get your system up and running in no time! Electrostatic discharge (ESD) can happen suddenly and its damaging effects is often underestimated. Exclusive ASUS anti-static chip, a protective circuit design, and the I/O shield provides four times better protection to extend component lifespan. Without BIOS setups, the ASUS exclusive Drive Xpert is ideal for anyone who needs to secure data on their hard drives or enhance hard drive performances without the hassles of complicated configurations. With Drive Xpert’s user-friendly graphical user interface, users can easily arrange hard drive backups or enhance their hard drive transfer rates—making sure that data is looked after every moment, every day. The design provides better protection against Electronic Magnetic Interference (EMI). 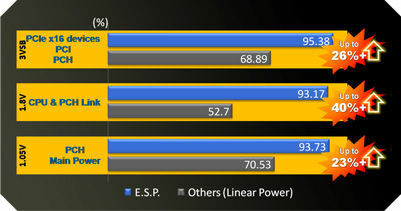 More rigorous testing, at 30% higher than the benchmarks, ensure better shielding of sensitive components. Enjoy High-End 10-channel sound system on your PC! The onboard 10-channel HD audio (High Definition Audio, previously codenamed Azalia) CODEC enables high-quality 192KHz/24-bit audio output, jack-sensing feature, retasking functions and multi-streaming technology that simultaneously sends different audio streams to different destinations. 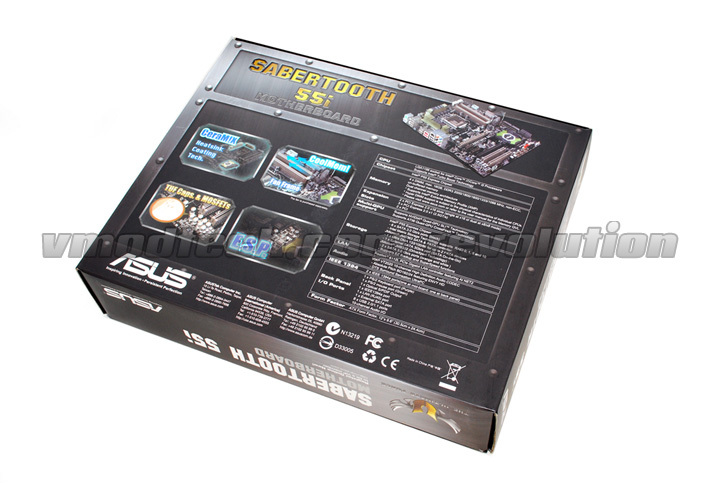 This motherboard now adopts the future standard to deliver the most vivid audio enjoyment!! With an easy press during overclock, this exclusive onboard switch allows gamer to effortless fine-tune the performance without having to short the pins! The specially designed ASUS Q-Shield does without the usual “fingers” - making it convenient and easy to install. With better electric conductivity, it ideally protects your motherboard against static electricity and shields it against Electronic Magnetic Interference (EMI). The ASUS Q-Connector allows you to connect or disconnect chassis front panel cables in one easy step with one complete module. This unique adapter eliminates the trouble of plugging in one cable at a time, making connection quick and accurate. Freely share and distribute favorite overclocking settings The motherboard features the ASUS O.C. Profile that allows users to conveniently store or load multiple BIOS settings. The BIOS settings can be stored in the CMOS or a separate file, giving users freedom to share and distribute their favorite overclocking settings. This motherboard provides convenient connectivity to external home theater audio systems via coaxial and optical S/PDIF-out (SONY-PHILIPS Digital Interface) jacks. It allows to transfer digital audio without converting to analog format and keeps the best signal quality.